David passed away on 11 February following complications from his heart attack. David came to Melbourne in January and played in the Roo and Masters. He was a fine player, a gentleman, had a wry sense of humour. Above all, he was passionate about real tennis. David’s home club was Moreton Morrell in England. He was also a regular player in the south-west of France. His contribution to real tennis was outstanding. We have David to thank for constant improvements to the handicapping system. As Chairman of the International Handicapping Sub Committee David was a master of his craft. He supported all the associations including the Australian Real Tennis Association. He loved a handicapping challenge, was very generous of his time often spending night after night adjusting our handicaps for the tournaments we played in the south-west of France. We will all benefit from his improvements to the system for years to come. In recent years, he developed the Real Tennis Online (RTO) booking system, adding new functions and improvements year on year. For the past two weeks the club has been supporting Anne, daughter Claire and son John who were with David during his illness. We are all thinking of them at this time. David had many friends throughout the tennis world and will be greatly missed. We were all very fond of him. He was a fine man. With the January tournaments finished the Club has resumed normal transmission which means that our wonderful chef Evie is back in the kitchen on Wednesdays and Fridays. The steaks are the best in town and the special of the day is always a delightful surprise. Come in and visit us, maybe book a game of tennis before or after, and bring your friends/colleagues/enemies/anyone who you can entice with food. If you bought a lesson package over the Christmas period you can now come in and have your lessons! Give us a call in the pro shop to book a time to help you prepare for the next pennant season or tournament. The annual club championships and this year’s John Poolman Trophy have started for 2017. All members are entered into the club championships so you will be in at least two, one off scratch and the other off handicap. Come in and check the boards to see who your first opponent is. For this tournament you’ll need a partner whose age combined with yours makes over 100. We have a few spots left so get in quick. Come into the club and sign up on the board or ring the pro shop. The first quarterly medal of the year is coming up, get in early to book your spot on Finals Day for 2017. We will have morning and afternoon sessions in the usual format. 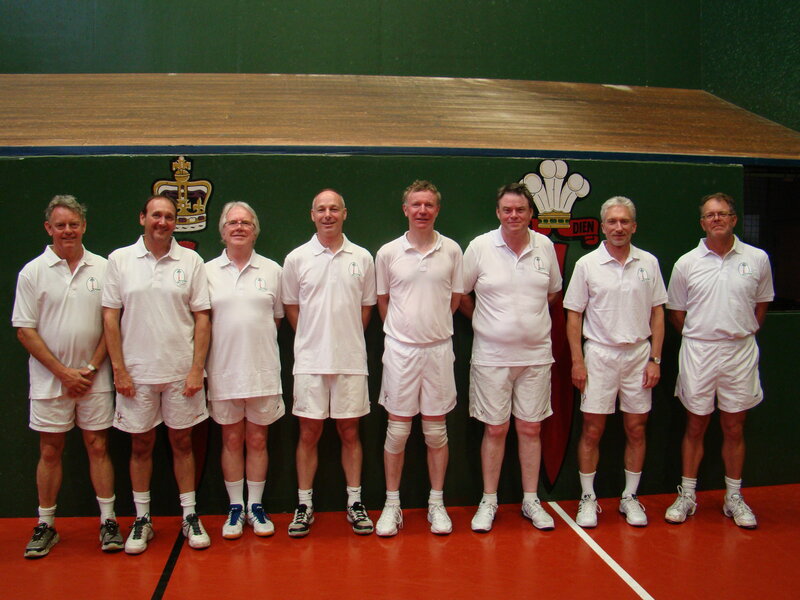 On Saturday the highly anticipated 60 Years & Under Handicap Doubles Tournament took place with six competitive parings taking part. The round robin matches were all very close. There were some very tense points along with some great shots by all. Shot of the match goes to Jo See Tan with an undefendable tambour boast into the winning gallery. At the end of the round robin stages, Luke Piccolo and Jackson Brand appeared to have shaken off the cobwebs from their recent Roo Tournament performance and ended with a clean sweep of 4 out of 4 wins. Richard Endersbee and new member Jarryd Williamson were also playing very consistently with 3 wins. Both teams had a warm a match against each other in the last match of the round robin stage before the final, where Luke and Jackson won 6/5 and against Richard and Jarryd. However in the final as with any good handicap match, it came down to 5 all, advantage all. With a few nervous shots from all players, Richard and Jarryd won the point that mattered and won the tournament, winning the match 6/5. Richard’s confident ground strokes at the back of the court and Jarryd’s strong volleying were too good in the end. Jarryd now joins an exclusive club by winning his first tournament he has played in while Richard looks to be in good form and will be a player to look out for in future tournaments. The day ended with a delicious barbecue and as with all Youth tournaments it was played in good spirits. Thank you to all those who competed and organised the tournament. 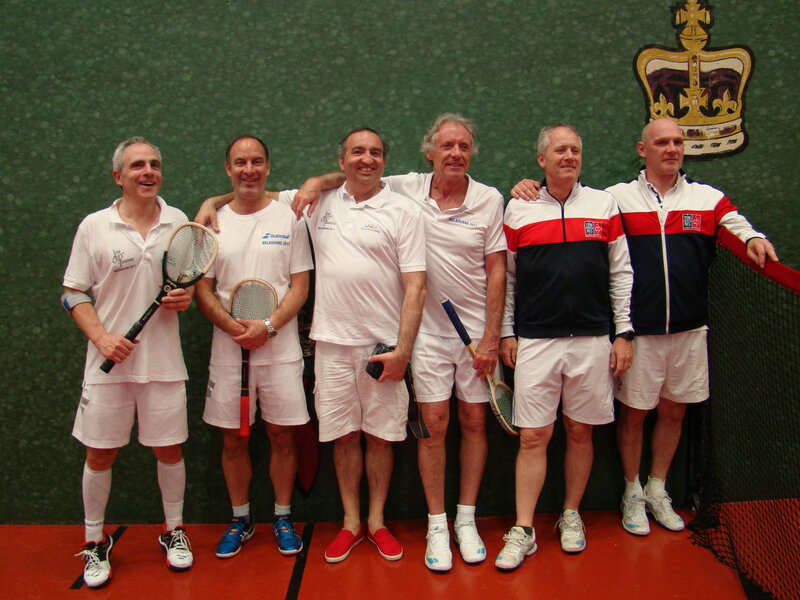 After a magnificent celebration to conclude the international teams events the evening of Monday 23 January, it was time for the over 60’s – 75’s to take centre stage on the Melbourne courts. 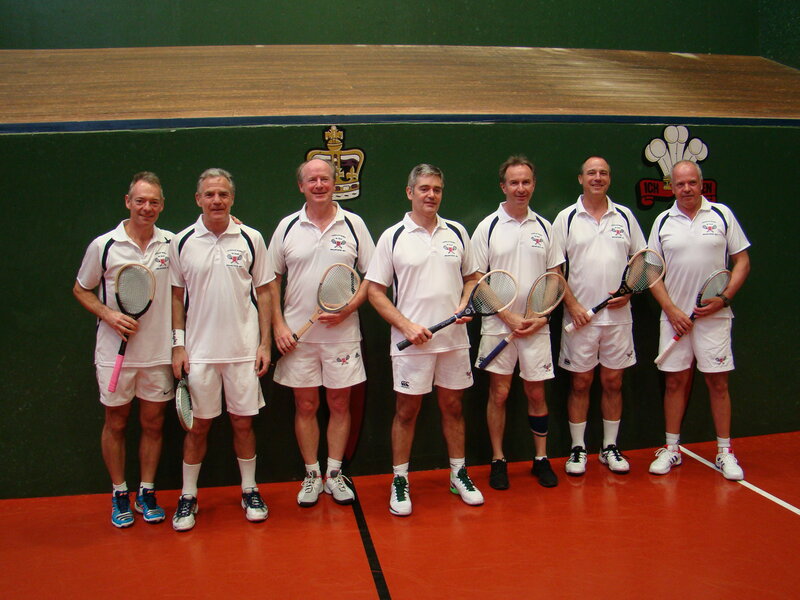 8 events for 4 age groups featuring both singles and doubles got underway after a practice day. Courts were booked solid and ice-packs were in full use. Frank and the pro team knuckled down for the final week of marking. In all they marked over 300 matches throughout January, an amazing effort. All members should be very proud of the light the shine on our Club. John Prenn (UK) was the stand out performer in the 60’s events, winning the singles defeating Richard Hince in the final. 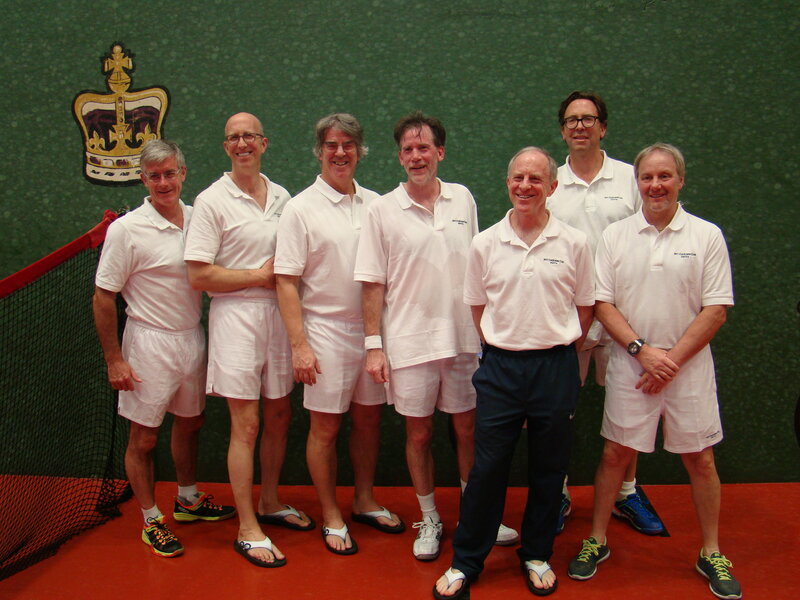 John teamed with Jon Hamer to also win the doubles final in a very entertaining 3 set battle over the all english pairing of Weaver & Shaw-Hamilton. Wayne Spring waved the flag for Australia by winning the 65 singles by defeating his UK nemesis Weaver. Weaver had his revenge in the doubles by defeating Wayne and Philip Barker. The Aussies put up a good showing but were outclassed in the end. Under pressure in the doubles final, Holloway (Hobart) and Faull (Ballarat) recovered from being a set down to win in a classic 3 setter. John and Graeme were as pleased as punch coming off the court after that epic battle. There was plenty of support for our own Paul Wheeler in the doubles final. It almost helped Paul win the second set, but to no avail in the end. There was plenty of fight on show with good competitive tennis enjoyed by all. Congratulations to the world champions listed above, as well as those in the other age groups featured in previous newsletters. A special thank you to Henry Turnbull and his team for his fine stewardship of the World Master’s, run in Melbourne, Ballarat and Hobart over January. Frank, Jonners, Kate and John – you are legends. Helen has done an amazing job keeping the accounts in order and processing 1000’s of chits – unbelievable! Paul Andrews, thank you for finding Liza for the catering – she’s a keeper! The amount of work that goes into this is considerable. A special thanks to the Committees and pro-teams and members of Ballarat and Hobart Clubs for co-hosting this event. Finally, thank you to our members for making your Club available throughout January so tennis enthusiasts from around the world can visit and enjoy everything great that our Club has to offer. Thank you. It is a significant privilege to have at our fingertips an honour bar which is available 24 hours a day. Please remember to sign a chit as it allows us to maintain this terrific feature of our Club. Please remember to bring your receipts for supper on the night. Lodging the receipts for supper on the night is a huge help for our hard working administration team. If you bought a lesson package over the Christmas period you can now come in a have your lessons! Give us a call in the pro shop to book yourself a time to come in and let us help you prepare for the next pennant season or tournament. The first young members doubles tournament of the year is on us, find a partner whose age added to yours is under 60 and you’re in. Sign up in the Club or give us a ring. At the other end of the scale for this tournament you’ll need a partner whose age combined with yours makes over 100. We have a few spots left so get in quick. Come into the Club and sign up on the board or ring the pro shop. The first quarterly medal of the year is coming up, get in early to book your spot on Finals Day for 2017. We will have morning and afternoon sessions in the usual format, drop in to sign up. Congratulations to Mike Garnett on being awarded the George Plimpton Award for Journalism from the United States Court Tennis Association (USCTA) at the World Masters cocktail party at RMTC on Tuesday 24th January. Mike has been a consistent researcher and writer about our great game, making a significant contribution to our collective knowledge on the history of tennis. Howard McMorris presented the award on behalf of the USCTA. 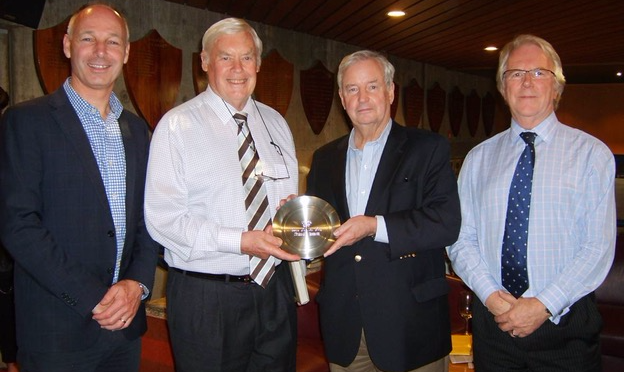 Pictured L to R: Fred Kininmonth (President RMTC), Mike Garnett, Howard McMorris (USCTA Representative), Henry Turnbull (Chairman ARTA). Join us on Friday for a relaxing beverage and chat to recap the busy month that was January. There will be a light supper provided and the usual happy hour specials. Evie from the kitchen will be taking a well-earned summer break. RMTC lunches will resume on Wednesday 8 Feb.